My research addresses topics in international and comparative political economy. My core research has focused on the consequences of economic integration for democracy, accountability, and prospects of income redistribution in emerging economies. I am also interested in economic voting, the politics of foreign direct investment and political risk, and Latin American politics. Click here for my C.V. in pdf format. 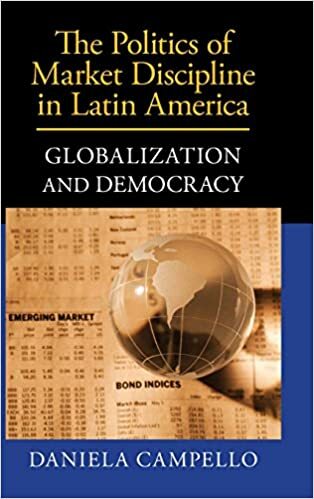 In this book, I employ a combination of formal theory, large-N empirical analyses, as well as in-depth case studies of Brazil, Ecuador, Venezuela and Argentina, to shed light on the inner workings and long term consequences of ians during national elections. It identifies how financial markets respond to the victory of the left, and determines the political and economic financial markets’ influence on economic policymaking. The book focuses on the interaction between investors and politic conditions under which market responses push leftist governments into adopting a conservative economic agenda. The book also explains why market discipline, imposed during elections, leads to long-term ideological convergence between left and right-wing economic policies in some political systems but not in others. Economic voting is a widely accepted regularity in the political science literature, yet most work on the subject either assumes that economic performance is a direct result of policymaking or, more recently, argues that voters can identify when this is not the case. Our book challenges these claims by showing that, in a large subset of Latin American countries, presidents’ success largely depends on factors that are unambiguously exogenous to policymaking. We adopt a multi-method approach to explore the conditions that affect voters’ capacity to distinguish competence from chance when evaluating their governments, as well as the implications of that behavior for representation. (2016, with Cesar Zucco) “Presidential Success and the World Economy.” Journal of Politics, 78(2): 589-602. Supplemental information, data, and replication materials are available here. (2015, with Leany Lemos) “The Non-Ratification of Bilateral Investment Treaties in Brazil: A Story of Conflict in a Land of Cooperation.” Review of International Political Economy, 22(5): 1055-1086. (2015) “Institucionalização Partidária e Consistência Programática: A Resposta da Esquerda a Ataque Especulativos na América Latina.” Dados – Revista de Ciências Sociais, 58(2): 427-460. (2015, with Cesar Zucco) “Understanding the Increasing Popularity of Brazilian Presidents.” in Jeffrey D. Needell, ed., Emergent Brazil: Key Perspectives on a New Global Power. Gainesville: University Press of Florida. (2015) “Does the Institutionalization of Party Systems Matter? Speculative Attacks and Political Responsiveness in Latin America.” in Torcal, Mariano (ed.) Institucionalización de los Sistemas de Partidos en Latinoamérica. Fundación CIDOB. CIS Press. Madrid. (2012) “The Politics of Global Financial Markets in Latin America.” In Santiso, Javier and Dayton-Johnson, Jeff (ed.) The Oxford Handbook of Latin American Political Economy. Oxford University Press, New York. (2011) “The Politics of Redistribution in Less Developed Democracies: Evidence from Brazil, Ecuador and Venezuela” in Blomfield, Merike (ed.) The Great Gap: Inequality and the Politics of Redistribution in Latin America. ed. Penn State Press.